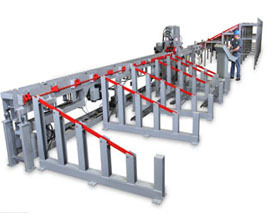 The KRB offers you an automated shearing/cutting line that will increase production and efficiency over manual shearing. There is also a substantial cost savings over a conventional shearline. The miniline is as robust as our standard line at only 10" (250mm) wide. The Miniline can be incorporated with the A114 Hydraulic Shear or the H2000 Guillotine Shear. The Miniline passline height-36" (915mm), the conveyor width-10" (254mm) It has belt drives with high efficiency in-line gear motors, hardened rollers-single flange, changeable.